Germany has become more dependent on brown coal to cover its energy consumption. 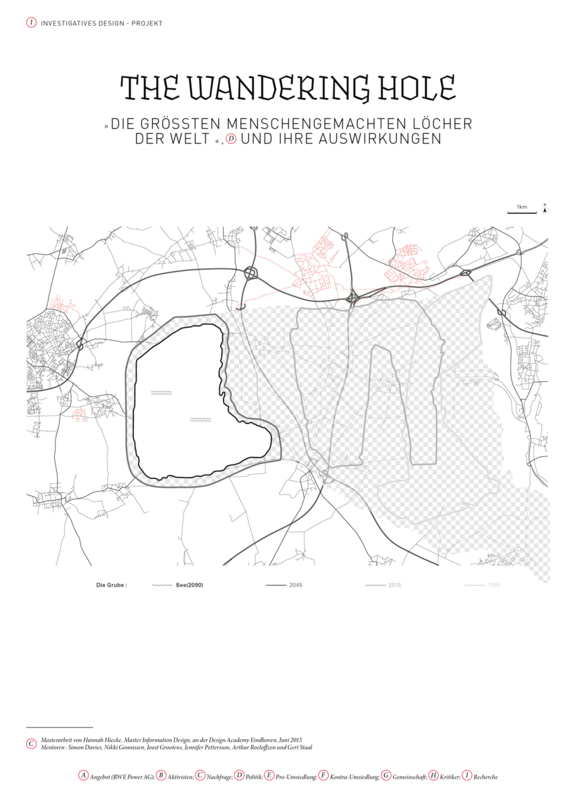 At a speed of 2,3 cm per hour the brown coal mining hole Garzweiler II ‘wanders’ through the landscape of Germany. Everything has to give way to the extraction of brown coal, up to 4.800 hectares until 2045. Ecological systems and social entities are put under enormous strain. The Wandering Hole researches the practices and consequences of brown coal mining. In 1995 Garzweiler II was approved by the government. Resulting in a long-lasting process of transformation for 15 historical towns, about 7.000 re-settlers and nature. Inhabitants have to deal with the consequences on a daily basis. They live in an in-between condition. Until today the route of the hole is clear. Garzweiler II is still moving ahead. Yet, it remains unclear how far the mining hole will wander. Here, Germany’s federal government has the final say. Beyond that, this issue is not only topical within Germany. Similar issues arise worldwide where national energy policies collide with regional and individual interests. For further information : Thesis "The Wandering Hole"